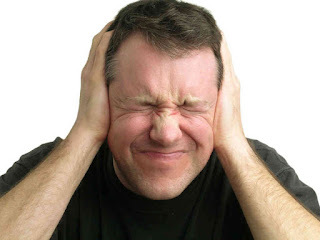 Perry Block - Nouveau Old, Formerly Cute: The Cut-off: To Sing or Not to Sing? As every Boomer knows, as we grow older we face an ever increasing array of Cut-offs. That is, we reach ages at which it no longer seems appropriate to talk, act, or dress in ways we once found natural when the world was young and we were younger. How old is too old to sing in public where others can hear? Walking across the quad at age 22 singing “Southern Man” with your best Neil Young may have once made you seem cool; walking across the parking lot at Target doing the same at age 62 makes you a tool. It's even worse for me. 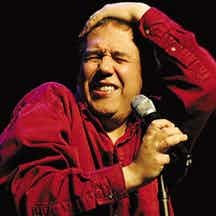 My singing voice has a vocal quality similar to that of comedian Gilbert Gottfried were Mr. Gottfried practicing the art of hog calling while cutting loose on the tender ballad "Feelings." Carry a tune? I’d need to call movers. Perfect pitch? That’s something I always seemed to attract whenever I was batting at softball. And yet still I sing. Often in public. Yet still I sing. Often in public. And when I do, the world often does seem a little bit brighter. Do Da Do Da Do! Embarrassed, I toned Van Morrison down to a decibel level which would register more readily with store patrons with four rather than two legs. Some folks yet regarded me in a less than loving manner. But I continued to sing. As I walked out of the store, I found myself breaking into “Awaiting on You All” by nobody less than George Harrison. As I rounded a corner I came face to face with a woman about my age. So what is the cut-off for singing in public? I've been guilty of singing my Anthony Newly version of "Jumpin' Jack Flash" while practicing my John Wayne swagger in Walmart. Unfortunately, much of today's younger crowd didn't recognize my impersonation and mistook it as Bob Dylan asking for directions to the nearest restroom. Another problem is I don't know any song that's less that 30 years old. I'm very familiar with "Southern Man" and know every other word to Van Morrison songs. But the truth is, no one sings ABBA like you, Perry. And neither do I. Fortunately ABBA "songs" are under 30 years old. And all I have to say about that is "Ding a ling a ling, Ding a ling a ling ding, Ding a ling a ling, Ding a ling a ling ding ..."
For years people have been thinking Chuck Berry wrote My Ding-a-Ling, when all this time it was you. Your modesty is only surpassed by your humility, my friend. Don't forget my ding-a-ling too.